This is something I'd been meaning to post for a long time. It's the beginning of (hopefully) a series of snapshots showing how the discussion regarding creators' rights in the American comics industry has evolved during the past decades. Generally speaking, things have improved since then (there are more choices available for creators today), but there is also a sensation of stagnation in many aspects (just look for example at the new generation of creators who have in past years been screwed by fly-by-night publishers who take all their rights in exchange for vague promises of future royalties). Things like Jerry Siegel's family trying to regain the copyright of Superman (by simply trying to take advantage of a modification in copyright law that enables them to do so) still generate some controversy today, partly due to lack of information (some people believe the Siegels are trying to change past contracts, which is untrue) or simply because there are people who believe that a publisher is more responsible of a character's financial success than its creators. In the same way there is plenty of room for improvement regarding creators' rights, there is also room (and a need) for informed discussion about this matter. 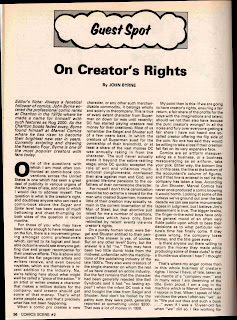 The following article is from Comics Scene #2 (cover-dated March 1982), and it's written by John Byrne at the height of his popularity. In it, Byrne defines himself as a "company man", making his famous statement: "I'm a cog in the machine which is Marvel Comics", and he also explains why he believes creators should accept the rules as they are, or at the very least not pretend that they weren't aware of these rules when they started working in the industry. In this article, Byrne also makes the somewhat bizarre statement: "If we are going to have creator's rights [...] should we not then also have (excuse the pun) creator's wrongs? In all the noise and fury over everyone getting a fair share I have not heard one so-called creator offering the flip side of the coin. No one has said they would be willing to take a loss if their creation fell flat on its very expensive face." This is an example of the viewpoint I mentioned before: believing that since publishers take risks when publishing an unknown property, they deserve a large part of the financial benefits if the property turns out to be succesful. This is a legitimate point of view, but by taking the argument to its extreme ("Is there anyone out there willing to return the money they made while producing some of these duds?") Byrne may have ended up weakening his argument. Freelancers do take a loss if their creations are not commercial enough; each failure means it's going to be more difficult to find work in the future. The point of this post however is to simply present Byrne's famous article, and not to rebut it point by point. Nevertheless, I'll show in future posts how other industry professionals reacted to this article, with what should be some familiar names popping in.